Anyone who has spent time with toddlers knows their propensity for putting anything and everything in their mouths. It's natural for a young child to explore his world by tasting different items. Some researchers suggest the practice is evolutionary. Mary Ruebush, a teacher of microbiology and immunology, says a toddler eating nonedible items "is allowing his immune response to explore his environment." Dirt is a nonfood item that young children everywhere tend to eat, and it isn't always cause for concern. Research demonstrates that eating dirt may alleviate nausea and diarrhea. Some cultures have eaten dirt throughout the years as part of their religion. When children are lacking in certain nutrients, they may crave unusual things like dirt, despite the dirt not containing the vitamin or mineral in short supply. Some children simply like the texture and taste of dirt. 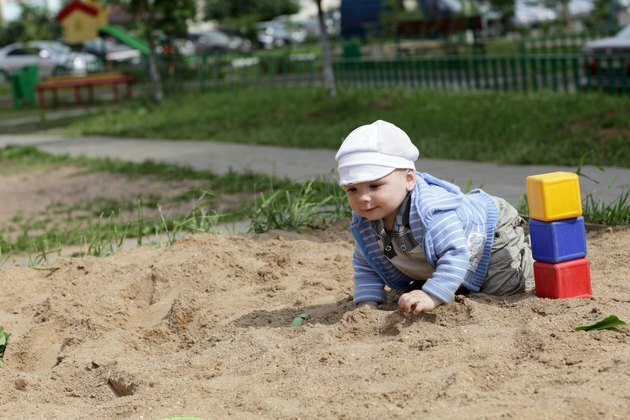 Ruebush suggests that eating dirt is a form of training for a toddler's immune system as well as "teaching the immature immune response what is best ignored." Similarly, Dr Joel V. Weinstock, a researcher at Tufts Medical Center in Boston, says a baby's immune system "needs instruction" and that completely eradicating organisms found in dirt prevents exposure to some that are beneficial. Another expert suggests that intestinal worms ingested through dirt are better at training the immune system in proper response than bacteria and viruses. While most experts assert that eating dirt is normal in children, there are dangers to the practice. Your toddler runs the risk of lead poisoning or ingesting other toxins if the dirt is contaminated. Parasites are another concern. The Centers for Disease Control and Prevention cites a report where two children contracted a form of ringworm, resulting in one death and serious neurological damage to the survivor. Most parasites are ingested through feces or other sewage in the dirt. Eating dirt can be a form of pica, a disease characterized by the desire to eat nonfood items. Signs to look for include consistent consumption of dirt for a month or more, despite efforts to curtail the behavior; continuation of the behavior beyond ages 2 or 3; and ingestion of more than 500 mg of dirt daily. Consult your pediatrician if your toddler exhibits any of these symptoms. Pica is often a temporary condition in children, but can persist if your child has mental or developmental problems.